So beautiful, in fact, that it allows you to apply to VARIOUS gigs all across the world and bill your clients online; all while hanging out in your pajamas. Unfortunately, it’s easy to get lost in all of the fluff sites and opportunities out there. If you’re a DSLR videographer or stay-at-home video editor, here’s a quick list of my TOP 3 favorite sites and explanations on how to get freelance video editor jobs. These 3 sites have allowed me to land clients all across the world, constantly travel, and live the free lifestyle that most editors/videographers always talk about. When I first started searching for how to get freelance video editor jobs, I tried all sorts of platforms. After bidding on HUNDREDS of jobs and creating profiles on almost all of the major freelancing sites, I discovered my top 3 that I know you’ll benefit from, as well as a couple of “job bidding hacks” that I’ll tell you about as well. Upwork.com is essentially the “Goliath” of freelancing sites out there (especially because they acquired Elance.com in 2015, who happened to acquire ODesk.com in early 2014). I can actually thank Upwork.com for landing me my first TV commercial gig, where I was contracted by a corporation in Texas to produce a TV commercial while my company was based in Atlanta, GA. Whether you’re a video producer, graphic designer, programmer, sound designer, or photographer, this site has something for any freelancer that handles digital content. And best of all, the basic account is absolutely free and lets you bid on up to 10 projects per month! On the flipside, if you want greater odds at landing clients, I’d suggest trying out the $10 per month individual account. There’s no obligation, you can always downgrade for free, and if you land 1 client, you’ve already made the $10 back anyway. Companies like Microsoft, Cisco, Oracle, Google, Citigroup, Dell, and even Facebook are constantly looking on Upwork.com for freelance video editors just like me and you. When you put that sort of opportunity into perspective, there’s absolutely NO reason you shouldn’t be on this site. In regards to having a “Free” vs. “Paid” account, only you can decide what’s best for you. But either way, you need to be on this site. It’s the jam. Guru.com is a great freelancing site to be connected on, even if just for the profile. Because two days after I setup my account, I instantly had someone contacting me locally for work! One of my first full motion graphic projects (After Effects) came from this site, and I didn’t even have to do any searching or bidding for it. The fact that my profile was established and contact info for my services were listed was enough for clients to begin contacting ME. Guru.com offers an opportunity for people in almost EVERY type of industry, not just media and digital arts. In fact, this site has a lot more long term projects and jobs on it than most other sites of the same caliber. As a free service with additional options to upgrade your account, Guru.com is pretty sweet. I’d definitely skim through this site for any and all work that you can find. ProductionHub.com is essentially the MAC DADDY for finding video production and freelance editor jobs. It’s heavily populated by producers all around the globe who are looking to engage with other video producers, actors, and filmmakers. The benefit of being on this site is the people that you get to meet and work with along the way. Thanks to this platform, I’ve had the pleasure of meeting quite a few interesting crews, directors, and other like minded individuals who all have the same passion for telling stories. Most of the jobs listed on Production Hub are for freelancers in the realm of videography, camera assistance, sound designer, production assistance, grip, assistant directors, production supervisors, and virtually any other position that is needed on a micro or major motion picture budget. Since hiring local freelancers is always cheaper than flying an entire crew out to a set, you get to reap the benefits of being in the right city at the right time. Plus, you get paid to help out on productions of ALL sizes; from smaller corporate shoots to big blockbuster films. Production Hub is absolutely free to sign up. PRO TIP: Try using this platform for networking and getting to know some major players all across the nation in the realm of film and video production. At the end of the day, it’s all about WHO you know. Not so much, WHAT you can do. Believe it or not, every now and then Craigslist has some pretty solid projects posted up, so don’t neglect it! Go to IFTTT.com. This is a free service that allows you to let any account that you have online talk to other accounts that you might have online. After you fall in love with this website, stop drooling, and set up an “action” to alert you every time there is a job post for “Video Editor” on Craigslist. What this will do is email you or send you a push notification on your smartphone every time video editing jobs are posted on Craigslist. You can instantly apply for the gig before everyone else! Set these up for all the big cities like Atlanta, LA, New Orleans, NYC, and Chicago. BOOM. Now you will never run out of projects to apply for. 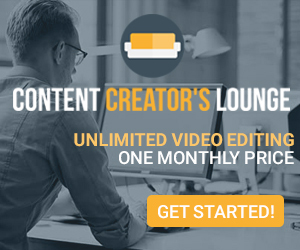 Need Some Extra Video Editing Work? My team and I get pretty busy and there’s always plenty of work to go around. If you’re looking for extra video editing work, click the button below so we can keep you in mind for upcoming video gigs. If you’re serious about making a living as a video editor with impressive skills, make sure to sign up for at least ONE of these sites noted above (and get on our exclusive “editor’s list”) to increase your odds of success. With a little dedication, these freelancing networks (and the Craigslist PRO TIP) are guaranteed to give you consistent work. All while you have fun doing what you love… in your pajamas. If you learned something or have a better platform to get consistent video production work, please feel free to share in the comments below! Hi Jon, I appreciate the time you’ve put into this post. On Dutch startup http://www.viedit.com movie makers can also find videography, animation and editing projects. Also, on Viedit there is no price pressure like on some other platforms. I hope you have the time to check it out for yourself. I’d be interested in speaking with you about your platform for a review. Shoot me an email so we can chat. We have a variety of freelance video editor jobs on our site as well as a section where you can post your resume to be found by potential employers seeking film/video freelancers. Interesting… let’s talk. We’d like to how your platform holds up before exposing it on our article here. Feel free to shoot me a message personally here. Thanks all for your post. I’m Eric a former marine video specialist looking to break into freelance. All this info is helpful.